I just got back from the Essence of Belly Dance workshop in Atlanta, hosted by Atlanta Fusion Belly Dance, and it was fabulous!!! This year Atlanta Fusion Belly Dance hosted Aziza of Montreal (cabaret style) and Sera Solstice (tribal fusion style). 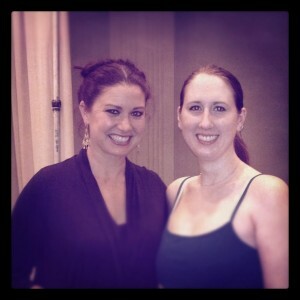 While I did not attend Sera’s workshop, her performance at the gala show was mesmerizing! Not to be confused with my teacher and mentor Aziza of Birmingham – another fabulous local dancer and friend; this Aziza is one of my favorite professional belly dancers. Her poise, stage presence, technique are second to none. She is amazing to watch onstage, and even better in the studio! My number one takeaway from her instruction was on dance posture: “If it doesn’t feel like this, it doesn’t look like this.” Aziza was describing that if it doesn’t feel like you are in the Egyptian Cabaret posture, it doesn’t look like it either. To achieve the elegance she has conquered you must engage your muscles, move with purpose and always feel like you are dancing, not slouching through a routine. I thoroughly enjoyed the workshop, especially the THREE amazing performances by Aziza. One of the performances was the choreography she was teaching us. It was great to see what we had been learning in the studio on stage in it’s finished form. Gorgeous new Egyptian Cabaret Costume. Silk, Chiffon, Rinestones & Silver Snakeskin. The workshop, as usual, was an intense set of drills and a mad dash to learn the choreography, but definitely worth it. I am returning to Birmingham chock full of new choreography ideas, and with a brand new costume too! I intend to debut the new costume at the Zivah Saphirah Casbah Cabaret III show later this fall. My final review: if you love Raks Sharki, i.e. belly dance, then you are going to love Aziza! !